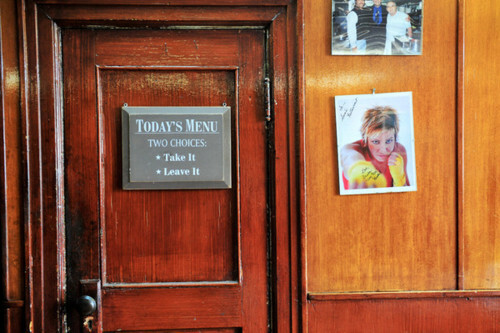 I’m sure there are plenty of people reading this that have something to say about Louis “Brooklyn Lou” Migliaccio, the owner of Sam’s Restaurant Pizzeria on Court Street. Perhaps you think he’s rude. Maybe you find his service to be unbearably slow. It’s possible you think his pizza’s no great shakes. Believe me, you are entitled to that opinion; I’m not here to argue with you. Lou’s got a tongue. If I wanted to catch a movie at Cobble Hill Cinemas, I’d probably grab a quick tostada from Buddy’s Burrito and Taco Bar. And you want to talk pizza? I’m a Di Fara’s girl. How about a little respect though? Sam’s is 81-years-old. Do you go off on your 81-year-old grandfather? No. And that’s because your grandfather is who he is. Call him set in his ways. Call him a tough nut to crack. The point is, he’s not changing. And he shouldn’t have to. It’ll be up to you whether or not you want to adapt to him. I think you should. But that’s just me. Some things to keep in mind: Lou’s on his own at the restaurant. He’s shopping for groceries, he’s working the kitchen, he’s bussing the tables, he’s taking your order, he’s fixing your drink, he’s calculating your check. Six days a week he’s there. In true restaurant-living style, he lived in the apartment upstairs until he was twelve, so if you’re there, you’re in his house. And like any house you go to visit, you’re a guest. You don’t tell your host what’s wrong with their house. Sam’s is of another time, but not just in its look. Yes, the tables don red and white checked tablecloths and the candy-apple vinyl booths squeak when you take a seat. The flowers aren’t real, the old telephone booths are broken and there’s an overall eerie dimness that’s kind of hard to ignore. If I were alone at Sam’s, I’d half expect to catch the ghost of an old bartender pouring shots of scotch whiskey from behind the mirrored bar. None of this is to say that Lou doesn’t enjoy joking around… because he does. His humor may not sit well with certain customers, but most of them can follow his sarcasm, and they know he doesn’t mean any disrespect. When Lou tells your kid to ‘sit down and eat your pizza, or else I’ll tape you to the chair,’ he’s not actually going to tape them to the chair. This is Lou horsing around. Let him. It’s fun. Sam’s doors have been open since 1930. Brothers Danny and Sam D’Arco (Lou’s great-uncles) planned on opening up the restaurant together, but Sam passed away before it could happen. It only made sense to name the restaurant after him. Over the years, Danny employed his family members to work at Sam’s, including newly immigrated nephew, Mario Migliaccio – Lou’s father. The year was 1950, and Mario started out washing dishes for $20-a-week. Today’s regular customers remember Mario as the pizza pie master who could be seen all the way in the back, peering out from the kitchen’s tiny take-out window. Having worked at Sam’s for nearly fifty years, Mario’s apron strings untied in 2009 when the death of his wife, Rosa, incited him to return to the island of Ponza in Italy. It’s where the two of them were born and raised; they were next-door neighbors. Now, at 83-years-old, he’s happy to be home again. Finally, he can rest. Anyone who has ever worked in the restaurant business is familiar with the exhaustion that comes with the job. Your life becomes the restaurant; there’s no way around it. Tuesday is Lou’s only day off, and he makes sure to spend it with his 11-year-old daughter, Corinne. Talk to Lou for a little while and, trust me, you’ll see through the gruffness. He’s even the first to admit that he can be a little hard. There was one drizzly afternoon where Lou and I sat together for over two hours, just chitchatting in the dim of the restaurant, the television tuned to some bad AMC movie. We talked about “this and that” until I couldn’t take the tomato-y smells from the kitchen any longer. He fed me Pasta alla Siciliana with mozzarella and eggplant – a deliciously cozy dish – and smirked at me when I tried to refuse a third glass of wine. (The infamous “Louie pour” goes up to the rim. Watch out.) In a heartbeat, Lou can really make you feel like family. Cathy Staiano, a Park Slope native, couldn’t agree with me more. 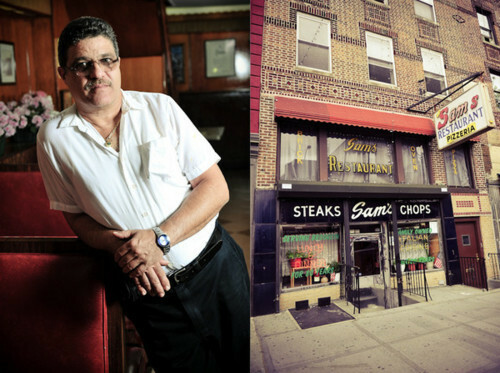 The Staianos have been eating at Sam’s at a minimum of once a week for the last ten years. “The food is great, and very fresh,“ says Cathy, whose favorite dishes include zuppa di mussels, fried shrimp, shrimp parmigiana and pizza with sausage. As for the customers who hate to wait for a table, Cathy doesn’t understand it. To be perfectly honest, I’d rather wait a long time for my food, knowing it’s being made fresh to order, rather than having it already prepared and delivered quickly. Chicken cacciatore does not take twelve minutes. Please remember that going to Sam’s is more of a cultural experience. It’s not the venue to grab a fast bite. Back in the day, real time was spent around the dinner table, socializing and conversing over a shared meal. It wasn’t wham, bam, thank you ma’am. Relax. Slow your pace. Let’s not forget that food is a means for establishing and maintaining connections amongst family and friends. Lou’s not worried about turning tables. What he cares about is maintaining the family’s recipes and dining traditions to the best of his abilities. And I think he’s doing a real good job at that.